Through his lifetime and legacy, Charles Frederick Goldie greatly influenced our nation's artistic and cultural consciousness. Born in Auckland on 20 October 1870, one of eight children from the marriage of Maria Partington and David Goldie, he was named after his maternal grandfather, Charles Frederick Partington, builder of the landmark Auckland windmill. In 1883 the young Goldie was enrolled at Auckland Grammar School. His youthful artistic talents shone, and it was not long before he was winning prizes at the Auckland Society of Arts. On leaving school, Louis John Steele become his mentor and tutor. Two of the young artist's still life paintings so impressed Sir George Grey, that he convinced David Goldie to allow his 22 year old son to attend the Académie Julian in Paris. Goldie spent over four years at the Académie Julian tutored by leading lights of the Paris Salon such as William-Adolphe Bouguereau. In 1898, fully informed in the French academic style, the artist returned to New Zealand and began collaborating with his former tutor Louis John Steele. The two worked on a number of paintings including The Arrival of the Maoris in New Zealand, a large scale history painting after Gericault's Raft of the Medusa. Before long, however, the relationship deteriorated likely caused by tensions around the former student's growing success. Goldie went on to open his own studio and establish himself as a successful portraitist of Māori. 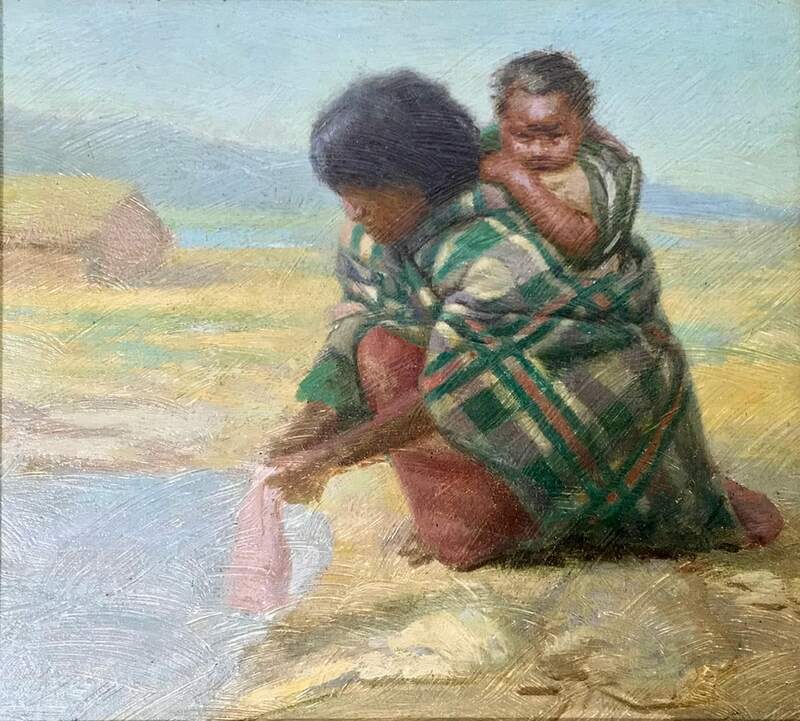 A visit to Rotorua in 1901 was the first of several field trips during which the artist was introduced to local Maori and persuaded them to sit for portraits. Goldie's works from this point forward strongly reflect the European tradition in which he was trained, and possess a stunning power and visual clarity. On the one hand, his remarkable dedication to realism belies an ethnographic interest. At the same time, he was also striving to capture the mana of his sitters who included chiefs, tohunga and kaumātua. Goldie formed long-standing relationships with several Maori he met and painted around this period, including Wiremu Patara Te Tuhi and Te Aho-o-te-rangi Wharepu (Ngati Mahuta), Ina te Papatahi (Nga Puhi), and Wharekauri Tahuna (Ngati Manawa). Over the next two decades, Goldie gained national and international acclaim and steady demand formed a strong market for his portraits, a number of which would later be exhibited at the Royal Academy of Arts in London and the Paris Salon throughout the 1930s. In 1920 the artist moved to Sydney, where despite original plans to continue on to Paris, he was married, at age fifty to thirty five year old Olive Cooper. Marriage in Sydney circumvented Goldie family disapproval of the relationship between Auckland's famous artist and the milliner from Karangahape Road. After two years in Sydney, apparently disillusioned with his work at this time and suffering from health problems Charles and Olive returned to New Zealand. Goldie's return to Auckland in 1924, ultimately represented a moment of artistic reckoning. Goldie received encouragement to resume painting from Governor General Lord Bledisloe. Devoting himself once again to his work, he began to apply a more liberal, impressionistic approach to the realisation of his portraits and repainted a number of his former subjects. Works from this later period are distinguished by their soft luminescence, offering a rhythmic departure and disconnection from the rigours of formalism to which he had so strictly adhered in the past. Goldie died in Auckland in 1947, his exquisite, spiritually-charged, often unsettling and ever powerful portraits of Maori having made an unsurpassed contribution to the history of art in New Zealand.